Top 10 News Papers in India With the advent of digital media, there has been some change in the print media. But, there is a strange revolution in the print media too. Unless the digital media had stepped into the media world, news reports had to be kept for the news. From time to time, this news could not even reach the print media house. Today, news of yesterday's news and tomorrow's news came in the days to come. In this case, the country had to give time in the evening at 8:45 in front of the television for what was going on in the world. At the same time, some newspapers had to resort to it. There has been a change since the arrival of digital media. As soon as there is a talk anywhere, only a few seconds or a live event gets information. It just happened to come from the digital media only With the advent of digital media, the print media got news in very short and short time, so that every news began to be printed from time to time. We will know the advantages and disadvantages of digital media in some other. Here we will know Top 10 Newspapers in India Many news agencies are working in the country. Many are such newspapers whose circular is limited to just one city. There are so many revolutions in digital media but, but the print media will never end. Today there are many bloggers and TechSavy who can take advantage of reading the book on kindle but still, they like to read the print book H. You can easily underline the print copy by reading. If you have something to write then you can write it. I also read the print book. Dainik Bhaskar is a major Hindi daily newspaper in India. It is a record of digital media in addition to the print media. It is also available as an ePaper with print media. In the country, it is published from 12 states in the 37th edition. Keeping in mind the language, it is publishing news in many other languages. As in the passing language, Divya Bhaskar and DNA are publishing aha life in the form of a magazine along with it in English. In the year 2015, it became the most widely read newspaper in the country. In 2015, when Dainik Bhaskar was getting started in Bihar to increase his business, many marketing and Surveyor teams were able to establish itself in Bihar even in very short days. Apart from this, there are many people who can learn a lot from Money Bhaskar and make their own business. In the year 1956, Dainik Bhaskar published the first newspaper in Bhopal with the name of the morning. In 1957 the English name was published from Good Morning India in Gwalior. A year later, in 1958, the name changed to Bhaskar News. In the year 2010, it was rectified in the name of Dainik Bhaskar, which is also present. Since then, it has remained the most read and reliable newspaper in the country. In 1995 it became the top newspaper of Madhya Pradesh. After this, it started spreading even outside of Madhya Pradesh with very decisive decisions. In 1996, started a newspaper in Jaipur and sold 50,000 copies in the same day and got second place. After this, Dainik Bhaskar left behind the Rajasthan Magazine, topping the top in 1999, after many distinctions and ups and downs to the first place. In 2000, the top English newspaper The Tribune, which sold 50,000 copies, left behind, sold 69,000 copies and got first place. From Freedom to 2015, only English newspapers were the most widely read newspapers in the country. For the first time in 2015, Dainik Bhaskar became the most widely read newspaper in the country. India is a very large country and the state has such a population so many countries can join. Dainik Jagran is the most popular newspaper to be read in North India. It has become the most widely read and the most widely circulated newspaper for many years. You might be surprised to know that the World Newspaper Association confirmed that the digital media has surrounded it so far, even though this newspaper is the world's most educated daily. According to the BBC and the Reuters record of 2008, Dainik Jagran is the most reliable source of daily news in India. Dainik Jagran was started by aggressive freedom fighter Shri Purnachandra Gupta in 1942. In 1942, the Indian independence movement was at its peak to be free from British rule. The British Quit India Movement was an important stage of this struggle. At this crucial juncture, the late Purna Chandra Gupta laid the foundation of Dainik Jagran. Its first version was released from Jhansi in 1942. In 1947, its headquarters were made from Jhansi to Kanpur. Dainik Bhaskar, along with his newspaper, included some such magazines like Chhangar, Yatra, Sangini, Josh, New Road which helped him to move forward. Apart from this, Dainik Jagran Group has also contributed a lot in the field of education. Punjab Kesari was started by Lala Jagat Narayan in the year 1965. Lala Jagat Narayan has been an Indian freedom fighter, legislator, member of Lok Sabha and founder of the Indian News Media Group. He was born in Vajirabad, Gujranwala (District). Which is now in Pakistan. Punjab Kesari started under the banner of The Hind News Limited. Punjab Kesari today is the largest media group in Punjab. Who is working on the publication of newspapers from many parts of Punjab? The story of Punjab Kesari, written on Ajay Devgan, is nothing less than the story of Gangajal. Despite its many struggles and many lives, its founder did not accept any haha and continue working continuously. Today, Punjab Kesari is one of the leading Hindi daily newspapers of India. It is published from different cities of India, Punjab, Haryana, Rajasthan, Delhi, Jammu and Kashmir etc. Lala Jagat Narayan, the founder, and editor of Punjab Kesari newspaper, who raised voice against terror in terrorism, was foiled by the terrorists by the terrorists. There is no religion of terrorists, nor do they have any relatives, their purpose is to spread terror only. After Lala Jagat Narayan, his son Ramesh Chandra was also killed by the terrorists. In any other post, I will have to face all the faces of the Punjab Kesari group. This post is being written in the top 10 Newspapers in India, then it moves forward. Punjab Kesari started from Jalandhar in the year 1964. Lala Jagannarayan was the founder of this newspaper. This is the popular daily newspaper of Punjab. A few years later, publishing of Jagbani was also started in Punjabi for those studying Punjabi. Punjab Kesari included many different journals with his newspaper. Such as Ravavanshariya, Satire Vinod, Art Culture, Story, Female and Player Edition. Every day it keeps some special edition in its newsletter. Punjab Kesari still publishes news with very boldness. Due to this boldness, Lala Jagannarayan and his son Ramesh Chandra had been killed by terrorists. At present, the editor of this newspaper is Mr. Vijay Kumar Chopra. In every house, the story takes a turn over time. Something similar happened here and the Delhi edition of Punjab Kesari started publishing Ashwini Chopra. Hindustan Dainik or Hindustan is the country's third-largest selling newsprint. Under the Hindustan Media, this newsletter is published from Delhi, apart from Bihar, Jharkhand, Uttar Pradesh, Uttarakhand. Hindustan Bihar is one of the most credible newspapers in the state. Its circulation in Bihar is also very much. Many other online portals also run with HT Media Hindustan Newspaper. One of which is Shine.Com. Which is a job portal.? Hindustan Media Ltd. It started on 12 April 1936. This group also publishes Hindustan Times and Mint in English. Amar Ujala is being published in the country's 180 districts along with the 20th edition of 7 States and one Center Provisional State. According to Ithe Indian Readership Survey 2017, it is the third most readable newspaper in the country. Amar Ujala was born in Agra in 1948. Amar Ujala publishes a newspaper of 16 to 18 pages a day. Amar Ujala has started from Agra. But, today its head office is in Connaught Place, Delhi. Rajasthan magazine started 62 years ago on 07 March 1956 by Kapoor Chandra Kailash. Its headquarters are in Rajasthan Rajasthan. It is published in addition to Rajasthan and 7 other states. This is the fourth most readable newspaper according to the Indian Readership Survey 2013. Rajasthan Patrika made its name in the digital world and its digital platform is making a lot of names. Something different was started by the Rajasthan magazine in the social media. Like all the state's separate Facebook page was made. Apart from this, there are some other newspapers which have been included in the list of Top 10 Newspapers in India. But detailed information about it has not been shared. Hopefully, this information must have been appreciated. Always try our best to bring good and interesting information to you. Please share this information with your friend on WhatsApp and other social media below. 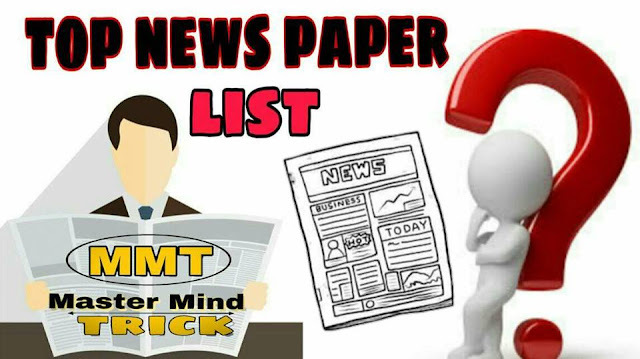 If you have any questions or suggestions related to Top 10 Newspapers in India, please tell it in the comments.